Sterling silver cut out square stamped concho with one turquoise stone set in the center with 2 hand made sterling silver feathers with turquoise nuggets. It measures approximately 3 3/4" long including silver plated french wires by 7/8" wide. It is Navajo made by Esther Begay. 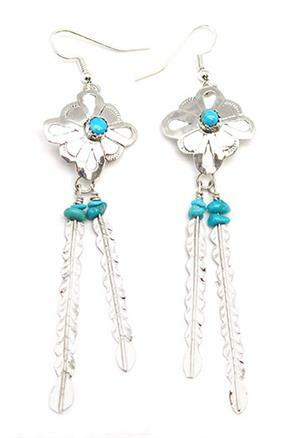 Color shade of turquoise and nugget size will vary.